Portland, OR. 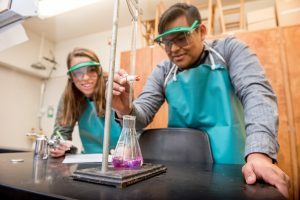 – September 10, 2018 – Warner Pacific University is leading the way in educational quality, value, and diversity, according to new Best Colleges rankings released today by U.S. News & World Report. Warner Pacific University ranked #1 in Ethnic Diversity (tied) for colleges in the West and was the only institution in Oregon to appear in the list. The University also ranked as a Best Regional College (#10), and a Best Value School (#8). U.S. News & World Report evaluated nearly 1,400 U.S. colleges on up to 16 measures of academic quality. The calculation of best value takes into account academic quality and the 2017-2018 net cost of attendance given an average level of need-based financial aid. The publication’s diversity rating factors in the total proportion of minority students, leaving out international students, and the overall mix of racial and ethnic groups. Today’s news comes on the heels of the University’s designation as a Hispanic-Serving Institution (HSI) by the U.S. Department of Education, making it Oregon’s first and only four year college or university to earn that title. Warner Pacific is also leaning into the Best Value ranking this semester as undergraduate students began the year with a 24 percent tuition reduction, making it the most affordable private institution in the Northwest.